← Oh, 1905. I miss you. I want to pay (a bit) more rent. So do you. San Francisco is notorious for its extreme tenant protection laws. Of course, these laws were designed with the best interests of tenants in mind. Rent control is one of these extreme tenant protections. The concept is simple and noble: let’s keep affordable housing for our residents, regardless of income, by keeping rent constant from move-in. What a noble ideal! But, what if the noble goal of affordable housing isn’t achieved with rent control laws? What if these laws make more problems than solutions? I believe rent control in its current form is harmful for the City and reduces the availability of quality, affordable housing. I have an artificially high incentive to retain my existing unit, even if it is not ideal. My reduced rent is ‘locked’ to that specific property. This incentive to remain increases each year as the controlled rent grows ever further from the ‘true’ market cost of rent in the City. Why is this a problem? This ‘locks’ people into their housing even if there is significant non-monetary incentive to relocate. For example, a change in employment makes a work commute nearly unbearable, undesirable roommates, or poor landlord service. In practice, rent control severely limits the supply of affordable housing, counter to its very purpose for existence. Developers can make a reasonable return on their building capital only if they build high cost rental units or condominium units for resale, not for rent. Imagine you have a lot of money and you want to invest your riches in property in the City. What’s the best return on your investment? Chances are, it’s not in creating affordable housing. Why? Rent control. Above: Revenue from the project is depicted in purple. I have omitted real numbers from the chart for simplicity. Rent increase may appear to be exaggerated, but given a long enough time-span it could well be appropriate. Above: Rent stays steady from move-in with a modest increase in rent over time which does not nearly match that of true market value increase. A new tenant moves in halfway through the time period, bringing the rent up to market value for one instant which then remains nearly constant after move-in. This is a significant loss. Any property developer with a brain would choose to NOT create affordable rental housing and would instead opt for extremely high cost rental properties (where the high margin could easily absorb the cost of rent control) or, more likely, create flats for sale only. Keep in mind that the margin for affordable rental properties is most likely pretty thin. Even if the income loss from rent control laws is slight, it may be enough to discourage affordable rental property development. Do we see these issues in the City? You bet. Nearly all the new properties built South of Market are high-cost flats for sale. Where is affordable City housing? What little affordable housing exists is rotting away in old victorian era houses whose landlords don’t have enough income for proper upkeep. Below-market rent makes it nearly impossible for landlords to afford maintenance and upkeep of property. It’s not just your landlord, almost all City landlords can’t keep up with proper maintenance. While rent remains constant, cost of upkeep services increase each year, eventually reaching a point where the landlord cannot reasonably afford either regular or preventative maintenance. Don’t expect a new kitchen. No incentive exists for significant property improvements with current tenants since the cost will not be borne until new tenants move-in. Finally, the low supply of housing means long wait times for those looking for apartments. Friends say (and I agree) looking for a place is a “full time job” and can take about a month. This is a waste of time for everyone involved. We want affordable housing for low-income residents. Our current rent control laws do not accomplish this goal. Rent control at present is an exclusive, overbearing tax for rental property owners. It benefits low-income AND high-income renters and severely limits available supply of housing. That’s the rub – what is a better solution than heavily taxing landlords? Society views landlords as evil moneygrabbers. Everyone hates paying their landlord. What could be a more popular piece of legislation than a law that punishes landlords at the benefit of tenants? What should be clear is that rent control does not necessarily benefit tenants as we had hoped. A more effective solution may be rental credits for low-income residents. How do we pay for it? I don’t know. But, we should strive for as free of a market as possible. Who knows, with a market free of rent control perhaps median rents in the City would be lower than they are now. Only with enough supply will the true market cost of rental property decrease. Rent control limits housing supply, driving up costs. It needs to be repealed. This entry was posted in econ and tagged apartments, control, cost of living, destructive legislation, econ, economics, government, market, pricing, rent, rent control, san francisco, sf, tenant rights. Bookmark the permalink. 7 Responses to I want to pay (a bit) more rent. So do you. The reason rent control is inefficient is because it decreases the number of transactions made in the free marketplace. A tax would generate income to pay for housing projects in SF and also allow more market transactions to take place. If you want to make the game politically winnable, why not remove the rent control but tax landlords? That is easier than taxing tenants, and—guess what?—landlords will transfer some of the cost of that tax to their tenants. Plus, since most people don’t understand economics, the tax will be politically feasible: you are swapping one form of pressure on landlords with another kind of pressure. The difference is that a tax allows freer movement of people among properties, hence better sorting and more opportunities for both landlords and tenants. Another idea, if the above doesn’t work: allow some uncontrolled zones in the city (say hip downtown apartments or commercial rents), and if that seems to revitalize those areas, then other zones might consider unlocking rent prices for themselves. Crasshopper – I agree on both points. A tax would offer more control for the City to increase, decrease, change rules, etc. Whereas the rent control arrangement is so fixed that it has many undesirable external effects like those you mentioned. I really like your last idea best. I think it might also be the most politically feasable, especially if dressed up as an ‘economic development zone’ or something (like SF’s South of Market Area). If all of SF’s SOMA apartments were rent control free, I think it would achieve a better mix of income diversity than at present — almost all of the development in SOMA are expensive flats occupied by wealthy ‘dot com’ers. With rent control free market rate rentals I think a flood of (even more) development would produce enough supply to start developing that neighborhood at an even quicker rate. 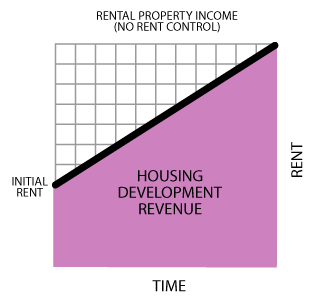 There is a logic for rent controls. Should the land LORD be guarenteed a cash cow forever? Must the tenent be trapped in a cycle of move,(to where?) when ever the rent becomes to high. Good rent control. can work and will work even if people with your logic dance on the moon freeeee!!!!! Thank you for allowing me to give you a bit of my fifty cents. We are here and not leaving soon. P.S. this is and example of the rich mans blog. Yes. Land owners have spent a great deal of time and effort to earn and save money to purchase a piece of property. They have an indisputable right to earn revenue from this property forever. No. Don’t be scared off by my view that rent control is wrong. I still think we need a solution to help low income residents pay rent, but rent control is not that solution. As crasshopper and I discussed above, we both believe that the government should help renters whose income falls below a certain line. A ‘rental assistance’ tax credit or even real funds toward the actual cost of rent would be funded through a collective local tax. A tax solution is better than rent control. 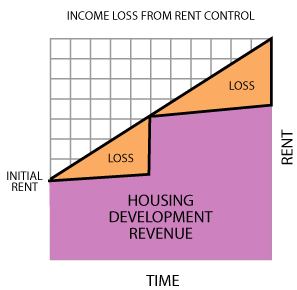 Rent control effectively taxes ONLY the property owner that chooses to rent property. 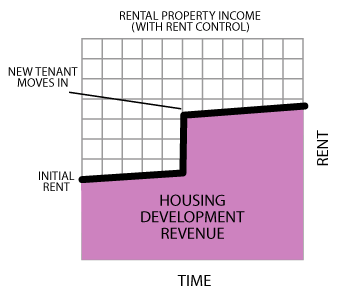 Rent control sharply reduces the amount of money that a developer can make from building rental units. If they can’t make as much money from building rental units, they won’t build as many (or any at all), which limits the supply of rental units, which increases the real price of rental housing. Instead of effectively taxing only the property owner who operates it as a rental, we should spread this burden among, at the very least, all property owners. Or, perhaps, all taxpayers in a community. I am not a rich man. My income is about half of the median household income for San Francisco and about 75% of the per capita income for the City (Source). I simply believe that rent control in its current form is not the best solution humanity can offer.